So what IS so funny about bookkeeping?? Answer: not a whole lot but let’s see if we can’t come up with something…. First of all, most words with a double-k in it are hilarious. Knickknack. Yakker. Trekker (or Trekkie, an identification with which I am proud to associate myself). Secondly, bookkeepers are inherently comical as the word conjures up imagery of the classic bespectacled accountant hunched over their old-school wooden desk, pounding numbers into an adding machine and buried in a mountain of scattered papers. But that bookkeeper was from 1954. These days we have these boxes called computers and are no longer buried in paper but in floppy disks!! In the real world, bookkeeping is a VERY serious matter. It’s the foundation of the structure that supports your business, from small, at-home side business to massive corporation. Without a strong bookkeeping function, the business owner leaves themselves open to a huge variety of risk, the most important of which is audit. 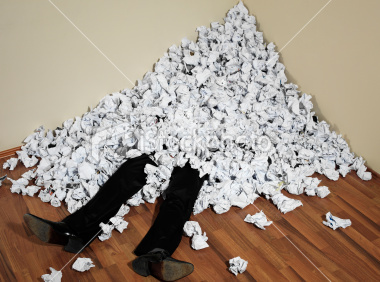 Think about it this way – hiring a good bookkeeper (ummm….like me maybe???) has only 1 downside risk; the financial commitment! Peace of mind that your business is being run correctly and that an audit (and the stress and cost that comes with it) is far less likely to occur. A strong reporting function so you know at all times where your business needs improvement, where you can cut costs and where you should be spending more. I could go on but we both know that wouldn’t end well for either of us…plus, I know how excited you’ll be to hear the rest of the upside of bookkeeping during our first meeting! Bookkeeping = exciting + important + floppy disks + framework = awesome. Thank you for providing information about the book keepng and this information is really very impressive. Thank you for sharing your wonderful thoughts with us. Previous Post Tax Tip Tuesdays – Tax and Steak…The Return of The Funny Accountant! Next Post TTT – How to Pay More Tax! Nope, no joke. Yes, read on!